According to Wikipedia: “Sir Garfield St Aubrun Sobers, (born 28 July 1936), also known as Gary or Garry Sobers, is a former cricketer who played for the West Indies between 1954 and 1974, and is widely considered to be cricket’s greatest all-rounder”. 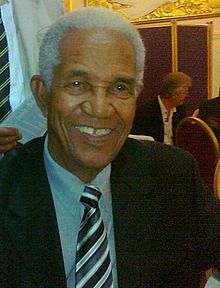 According to a website thrown up as a result of a Google search on great cricketing all rounders, Gary Sobers is the “Greatest West Indian All-Rounder in History, a threat for the opponents with both bat and ball he was also excellent fielder, captained the West Indies for many years. the two most all-rounders can claim to be. He could bowl both fast-medium and spin, being effective with both. But it was as a spin bowler that Sobers was picked first time for the West Indies team, often batting low in the order. He would go on to take 235 wickets at an average of 34.03. His average of 57.78 is the 10th-best on the all time list and compares with any batsman in the history of the game, with the exception of the great Sir Donald Bradman. He scored 26 centuries and 30 fifties. But his most famous feat remains the 365 not out he scored in 1958 against Pakistan team. At the time, this was a world record, a record that would stand until it was broken by great Brian Lara in 1994. It still ranks as the fifth highest score ever in test cricket. one of the best batsmen, good bowler and great cricketer”. People may argue about my selection (which is why such debates among cricketing nerds are such fun) and it should be borne in mind that us oldies have a tendency to cast our minds back a long while and neglect the current crop of players. I should also mention wicket keeper all rounders and, on balance, I would give the nod to Adam Gilchrist just ahead of Alan Knott. Strictly speaking, to be cast as a genuine Test all rounder, the person nominated should be able to warrant his place in the team on batting and bowling ability alone. One or two in the above list may not strictly qualify on those criteria, and some have done better at the one day form of the game, yet all the above have made outstanding test contributions with both bat and ball and have enthralled many by their performances. Where I suspect there will be a broad consensus about the greatest all rounder of all time, is concerning Gary Sobers, who was my boyhood cricketing idol and is widely admired by all genuine cricket lovers regardless which team they support, including among the greats of the game. It was Sobers, more than most, which got me interested in following cricket in the first place. The reason why I raise the matter now is because during the lunch break in yesterdays test match, TMS special profiled Gary Sobers. I was again reminded how much he has contributed to cricket. The latter part of Sober’s career saw the West Indies begin to dominate world cricket for a long time to come and part of that reason was Sobers. These thoughts came to mind on a day when Pakistan, who was widely expected to capitulate to the English bowlers, managed to turn the tables, much to their credit. And it is players like Sobers, who had the habit of doing just that by coming up with outstanding performances, that make cricket a game I love to follow.